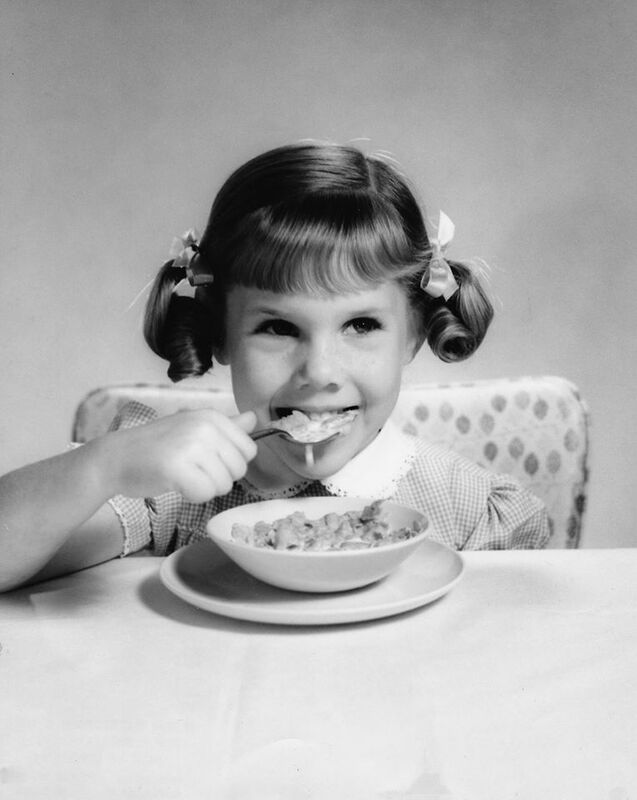 As a child actress and model, I was photographed in all sorts of poses, including a few like this one – eating a bowl of cereal and milk. Of course, I had no idea then how cruel the dairy industry is or what goes on at dairy farms. Thank goodness I know now. 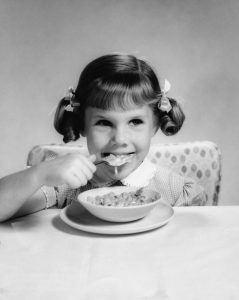 We’re so used to drinking cows’ milk we never think about what dairy cows and their offspring endure for people to pour milk on their cereal. Did you know that human animals are the only species on earth who drink the milk of another species? And did you know every animal in the animal kingdom stops drinking milk after they’re weened, except for – you got it – human animals. Although the dairy industry would rather you didn’t know and tries to hide this fact, lactose intolerance is a natural and common condition among humane. Lactose intolerance affects approximately 95 percent of Asian-Americans, 74 percent of Native Americans, 70 percent of African Americans, 53 percent of Latin Americans, and 15 percent of Caucasians. Symptoms include gastrointestinal cramping, diarrhea, and flatulence, and occur because the lactose intolerant do not have the lactase enzyme to digest the lactose, the sugar naturally found in milk. 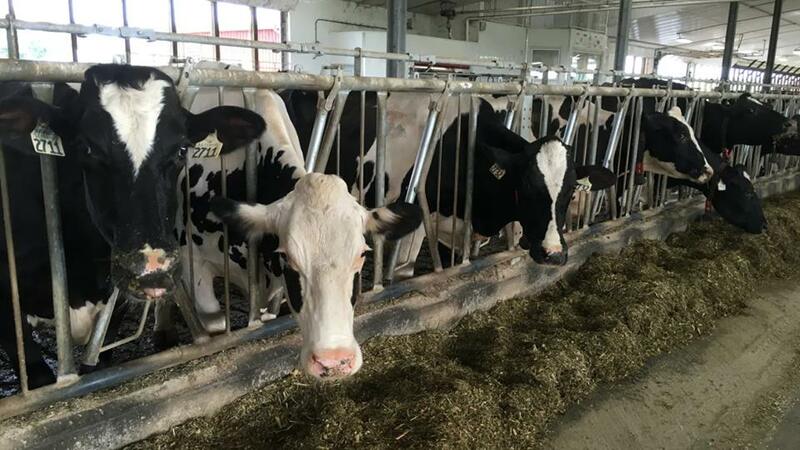 The dairy industry would like you to believe that dairy cows graze contentedly in green pastures before being led into a rustic red barn to be milked. Nothing could be further from the truth. 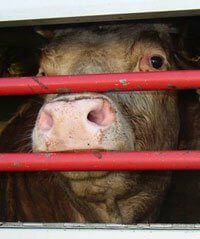 The reality in today’s world find thousands of cows packed tightly together in nightmarish factory farms, hooked up to painful and frightening machines. A cow’s natural lifespan is about 20 years, but cows used by the dairy industry are typically killed after about five years because their bodies wear out from constantly being pregnant or lactating. A dairy industry study found that by the time they are killed, nearly 50 percent of cows have painful mastitis – grossly enlarged and misshapen udders – and are typically lame and infected from standing in intensive confinement on concrete floors and in filth. If that weren’t cruel enough, do you know what happens to all those calves brought into the world in order to keep their mothers producing milk? First, calves are torn away from their mothers within 24 hours of their birth. 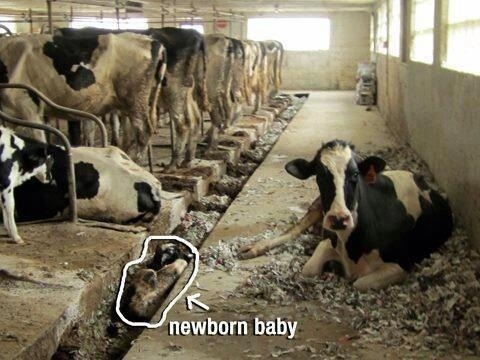 This is traumatic for both mother and calf; mother cows can be heard crying out for their calves for days. Female calves will live short and cruel lives just as their mothers do, but a different fate waits in store for the males. 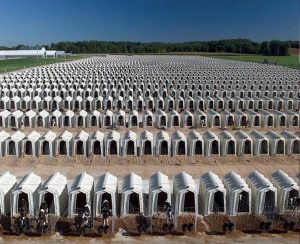 Most male calves of dairy cows are shipped to barren feedlots where they will be fattened and slaughtered for beef. Those are the “lucky” ones. 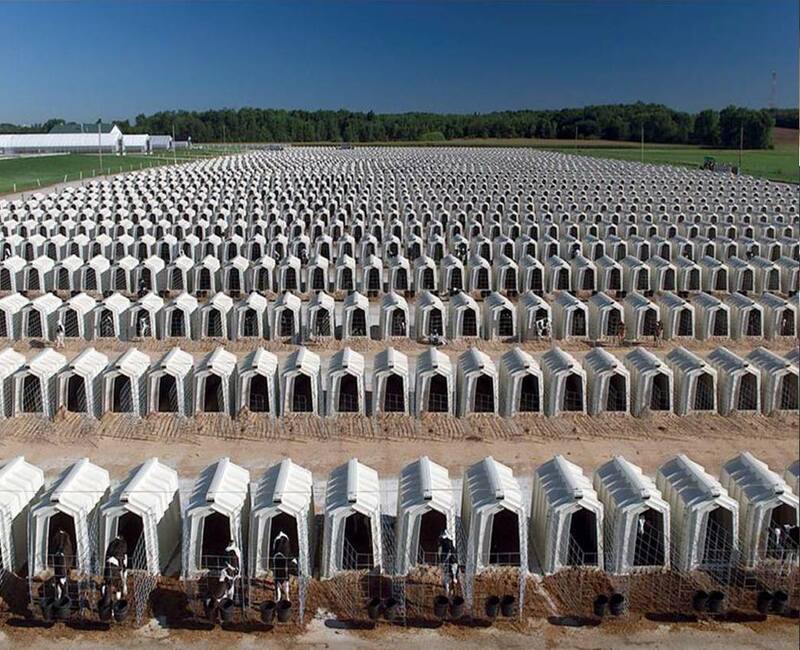 A “city” of veal calves, each imprisoned in his own tiny crate at a factory farm. Some male calves are turned over to the veal industry. These calves, beginning at a day or two old, are kept 24/7 in tiny crates, a chain around their neck to prevent them from moving about or even turning around. The muscles of calves who cannot move atrophy and remain tender. To make their flesh white, the calves are fed a diet lacking in iron and any real nutritional value. Veal calves typically suffer from anemia, diarrhea, and pneumonia. Frightened, sick, and isolated from other calves, these poor animals are slaughtered after a few short months, and their flesh stripped and sold. That tender, pale veal neatly packaged in the meat case of your local supermarket is the end product of a short, sad, and brutal life. Those who refuse to eat veal because of the cruelty involved ought to be aware that drinking cows’ milk or buying dairy products – butter, cheese, ice cream etc. – are still supporting the veal industry with their wallets. The good news is that removing dairy products from your diet is easier than ever. Today, there are many cruelty-free vegan alternatives at your supermarket, such as soy, rice, oat, almond, coconut, and pecan milks and ice creams, tasty vegetable-based spreads, and delicious cheeses for cooking and eating. Please try them – they’re great!